An ad for the game. Codename KND: Operation B.E.S.T. 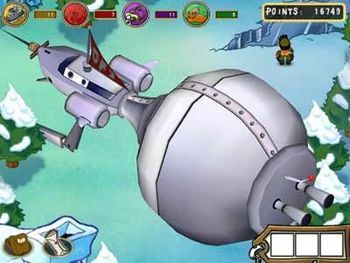 was an MMORPG style game on the Cartoon Network Website created and shut down in 2005. 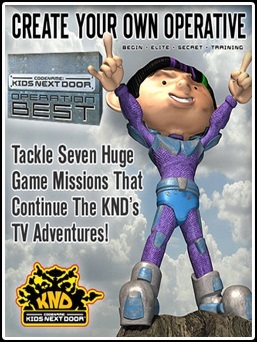 This game's purpose was for the player to create their own KND Operative to take on missions as a member of Sector V to gain points for a high score. Operation B.E.S.T. lasted until someone gained the highest score. After the game's highest score was displayed on TV, it was shut down forever. Minus a commercial and a few screenshots, little other information on the game is available. After the game closed down, the player with the highest score was revealed on a television episode to be a player from Hawaii named "Ninja Z". Nothing else is known about the identity of "Ninja Z". On March 24, 2018, YouTube user Les Bird uploaded 2 episodes of gameplay from the Operation B.E.S.T. He later uploaded the game file onto his website. Training - "You are assigned to go to the Arctic Base to be trained by Numbuh 60 before being sent to Sector V. (You may return here anytime if you feel you need more training.)" Mission 1 - "Candy hungry hostile zombies wreak havoc upon the neighborhood. It's up to you to put a stop to this madness and eliminate the problem at the source." Mission 2 - "Numbuh 6 has gone berserk. You are to obtain a new weapon to shut down Numbuh 6 and fix the skunk with Numbuh 2's assistance." Mission 3 - "H.I.P.P.I.E.-H.O.P. has gone berserk! You'll need to shut it down with the help of Numbuh 3." Mission 4 - "A bunch of robots from the house of the DCFDTL are terrorizing the streets. 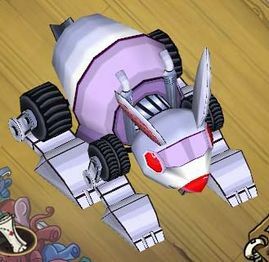 Sneak into the mansion of the DCFDTL and put an end to the machines' objective." Mission 5 - "Cree and a team of lollipop-loving teenage girls are up to no good. With the help of Numbuh 6, infiltrate the hospital to stop Cree in her tracks." Mission 6 - "Numbuh 13 has been stirring trouble in the treehouse. Stop his army of clones and take down the original perpetrator before anything worse happens." Mission 7 - "Numbuh 4 asks you to jump into his swimming pool where you stumble upon the negative universe. Scout out the area and be sure to put an end to Negative Numbuh 4's reign." Episode one of gameplay footage, posted by Les Bird. Episode two of gameplay footage, posted by Les Bird.